Home / Blog / Say “Good-Bye” To Summer In The Sweetest Way With Wockenfuss! Summer’s not over yet! You can still get the most out of the last few summer days with these delectable, gourmet sweets. Whether you’re ready for it or not, the summer’s end is drawing near. With Labor Day Weekend quickly approaching, you still have time to share delicious, locally-made candies with all your friends and family members. Summer’s not over yet! You can still get the most out of the last few summer days with these delectable, gourmet sweets. Are you psyched for the Ravens’ regular schedule to start up? Have you been watching every second of the O’s games this summer? If so, these festive, team-colored nonpareils are the candies for you and your Labor Day Weekend party guests. The Ravens enthusiasts will love the purple and white sprinkles on these melt-in-your-mouth chocolate specialties. For O’s fans, orange, black, and white sprinkles will allow you to enjoy the late-summer games even more. It goes without saying: pretty much every Marylander loves to eat crabs. Whether you enjoy crab cakes, soft shell crabs, or picking them all night, crabs are simply a Maryland staple. With crab-shaped chocolate candies, you’ll find a way to impress your crab feast guests with more than just your crab dinner. 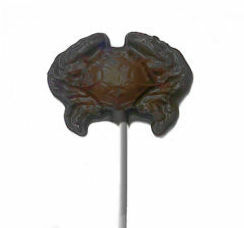 These creamy delicacies come in both dark and milk chocolate so that every kind of chocolate-lover can find a crab chocolate to suit their sweet tooth! Taffy is summer for many Marylanders. Eating gourmet saltwater taffy as you stroll the Ocean City Boardwalk is an annual pastime for many people, and Labor Day Weekend is the perfect time to enjoy some more of your favorite taffy. No matter what flavor you prefer, there’s a saltwater taffy that will bring back summer memories that will last a lifetime. ENJOY YOUR LABOR DAY WEEKEND WITH WOCKENFUSS CANDIES! This entry was posted on Friday, August 31st, 2018 at 9:45 am. You can skip to the end and leave a response. Pinging is currently not allowed.